How to obtain a temporary residence permit in Belarus? If you want to stay in Belarus for a long period of time, thus planning to stay here for more than 90 days (three months) in a calendar year, but you do not have any grounds for obtaining a residence permit, then you can apply for a temporary residence permit in Belarus (hereinafter – TRP). you are being treated in a hospital. You can come to Belarus for a long-term hospital treatment and get a TRP for this time. If you are eligible under one of the above conditions, you need to collect a package of documents and bring it to the Citizenship and Migration Department at the place of your intended residence (schedule and addresses of CMDs). If you are a family member of a foreign citizen who also obtains a TRP, you need to provide a letter confirming the legal source of income. For example, an extract from a bank account, an employment contract. Making a permit takes 15 days. However, if you receive a TRP in connection with the marriage, then the procedure might take up to 30 days. They say, in some cases, it can be issued even in the same day. The permit is a small insert into your passport, with which you usually go abroad. Usually, the permit is issued for no more than a year. If you still have grounds, you can extend it for another year. 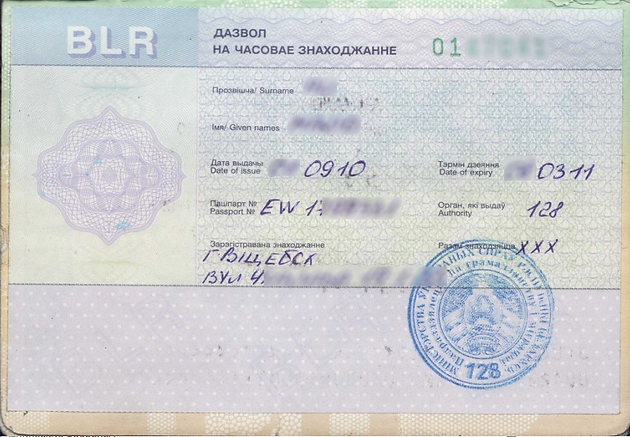 If you live in Belarus for more than 7 years, while renewing the TRP in time, you can apply for a residence permit. if your stay is contrary to national security, public order, health, morality, rights and freedoms of other citizens, in general, if you violate the law. It is important to remember that by law you are obliged to reside in the place of registration. A district policeman can check this. If he finds out several times that you do not reside there, you may be deprived of a TRP. If you change your place of residence, you must notify the internal affairs agency. You must provide the documents on the registration at the new address. If you have any legal questions or questions on the rights of foreign citizens in Belarus, write to us at the mail: legalhumanconstanta@gmail.com or call to our consultation +375 44 562 38 42.